Agents for Home Buyers, Buyer Agent Representation, Buyers' Agents, Buying in NYC, Should You Hire a Buyer’s Broker in NYC? | Agents for Home Buyers, Buyer Agent Representation, Buyers' Agents, Buying in NYC, Should You Hire a Buyer’s Broker in NYC? You can find any listing online, so why do you need a buyer’s agent? 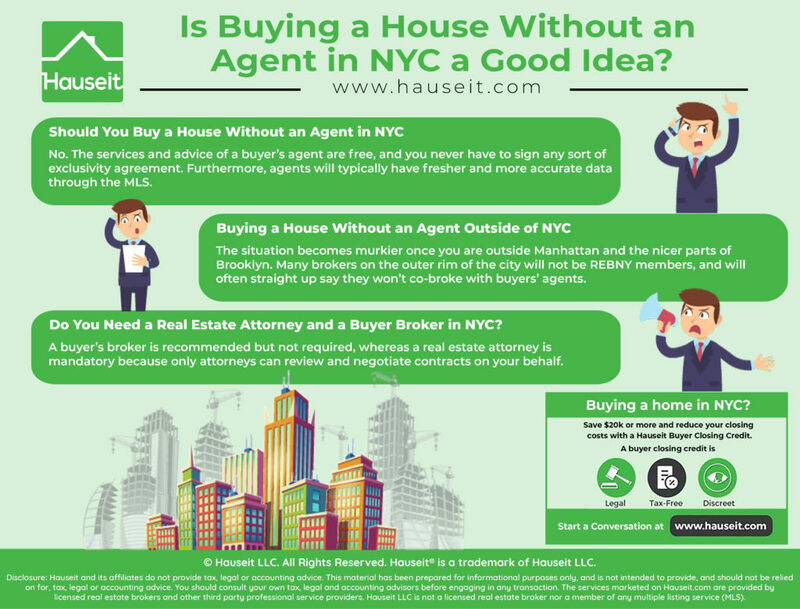 Is buying a house without an agent in NYC a good idea? What about in Westchester or Queens or Long Island? What will you miss out on by not having a buyer’s agent in New York City? Do You Need a Real Estate Attorney and a Buyer Broker in NYC? 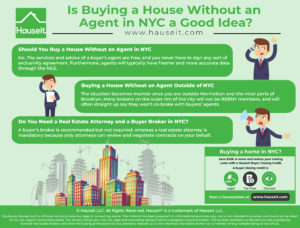 Thinking about buying a house without an agent in NYC? Despite popular misconception, this is actually not a good idea. You might think of a buyer’s agent in NYC as an unnecessary middleman when popular search websites are so easy to use. Or you might be thinking that you’ll have an advantage going in unrepresented. After all, wouldn’t listing agents like to deal direct and not have to split the commission with another broker? Think again. The truth is, almost all NYC brokers are members of REBNY which means they’ve signed an agreement where they are contractually obligated to “co-broke,” or share the commission with buyers’ brokers. There are strict penalties and fines for non-adherence or violations. Therefore, you face absolutely no discrimination by listing agents if you’re working with a buyers’ agent. Furthermore, a buyers’ agent will always have fresher and more accurate listing data than you do by virtue of their access to their local inter-broker databases (i.e. the MLS). Why is it fresher you ask? Again, remember that agents in NYC are contractually obligated to keep their listing data fresh. Any updates must be reflected within 24 hours or the broker faces serious fines. The penalties are harsh and escalate quickly for additional violations, so brokers are extremely incentivized to update their entries in the inter-broker databases immediately. In contrast, listings on consumer search websites are under no such obligations. It is up to the search websites themselves to periodically refresh their data from the inter-broker databases. For example, The New York Times or StreetEasy may get updates of broker listings from the RLS (REBNY listing service) or a RLS data vendor such as Nestio or OLR every one or two days. As a result, you’ve no doubt clicked on many a listing which already happened to have an accepted offer or was otherwise unavailable. This is quite frustrating and can lead to many hours lost being solicited by listing agents to show you other listings since theirs is already taken. The best way to avoid this time waste is to work with a seasoned buyer’s agent who will search for listings on your behalf! If there is an error in the data relay that shows up on a public search website, the broker is not obligated to correct it. Notice the difference however vs the inter-broker database where the broker is incentivized and obligated to immediately correct any errors. As a result, simply because the brokers have a severe incentive and obligation to keep their listing data fresh, and because most listings are by brokers, the broker database tends to have the freshest data available. And because only brokers have access to these databases, it makes sense to work with a broker during your home search. So you’ve saved up a chunk of cash for your first home and you want to know whether buying a house without an agent in NYC will give you an edge. The truth it, it depends completely on where you are buying a house. The situation becomes murkier once you are outside Manhattan and the nicer parts of Brooklyn. There are still broker associations in the Bronx and Brooklyn for example but the rules and behavior are much looser. Here, it may sometimes be a disadvantage to work with a NYC buyer’s agent. The reason is, these brokers may not have a contractual “co-broke” agreement signed by default, and as a result listing brokers will obviously try to keep the entire commission for themselves. Even though this is ethically wrong and against real estate license law, listing brokers may often play hard to get with buyers’ agents. According to real estate license law, real estate brokers must submit all offers to the owner and not withhold any information. According to NY real estate license law, listing agent must deal fairly and respect the wishes of a buyer to work with the agent of his or her choice. However, listing agents are not required to split commission with buyers’ agents unless there is a pre-existing agreement in place, such as a MLS co-brokerage agreement. If buyers’ agents suspect that an unscrupulous listing agent is avoiding him, he can always bring this to the attention of the listing agent’s managing broker or the seller directly. We’ve heard stories of buyers’ brokers being told by unscrupulous listing agents that they refuse to co-broke. Sometimes the reason is “because you’re not a member of my trade association,” and sometimes there is no reason given at all. Often times, the issue is simply the professionalism of the listing agent him or herself. We’ve heard many stories of direct buyers trying to schedule a showing for properties in the Bronx only to be completely ignored. In certain cases because of the unprofessional conduct of brokers in certain areas, it may be a huge benefit to work with a buyer’s agent who has the most up to date listing data so you’re not wasting time on out-dated and unavailable listings. Listing brokers may also take a middle ground if you are working with a buyer’s agent. They may agree to show the property, but insist that your buyer’s agent accompanies you to the showing. This may be extremely inconvenient to your buyer’s agent if say you are looking to buy in the Bronx and your agent lives in Manhattan. This may also disrupt your plans if you were planning on working with an agent providing a buyer agent commission rebate. The buyer’s agent will usually not agree to full service especially if he or she is providing a rebate of his or her commission. This is typically not an issue in higher priced Manhattan properties however, where even a partial rate commission makes sense to most brokers. A great way to increase your chances of receiving a buyer’s broker commission rebate is to work with one of our partner brokers who is a member of the local broker association. Our partner brokers are members of REBNY (Real Estate Board of New York), HGAR (Hudson Gateway Association of Realtors) and LIBOR (Long Island Board of Realtors). We’ve got you covered wherever you happen to be buying in New York! That depends on where you are buying and whether you are buying a house without an agent. In California, real estate attorneys typically aren’t used in transactions as the contracts and forms are all standard templates which the Realtor will walk their client through. In this situation the Realtor adds quite a bit of value to their client. In New York City, real estate attorneys are required for transactions because the purchase and sale contracts and transactions are generally more complex than a suburban single family home. As a result, real estate agents in NYC only handle the matching of buyer and seller on agreeable terms. In this situation you will definitely need an attorney whether you are working with an agent or not. In fact, NYC brokers don’t contribute much after having found a “ready, willing and able” buyer for the seller and often don’t even bother to show up at closing. Usually brokers will stop by the attorney’s office at some later more convenient time to pick up their broker commission checks. So in short, it doesn’t matter legally in NYC whether you’re buying a house without an agent or not, but you are required to hire a real estate attorney. This is Mojo, Raquel’s husband writing. Lovely meeting you in the Park on Sunday! Thank you for your interest in being a “buyer representative” for our elusive and eventual pied-a-terre. However, we are not in the market for a buyer representative. Isabella and I are quite adept at locating apartments of interest on StreetEasy and other web sites, and have been going to open-houses in the city for the past year, knowing one day we will find the apartment meant to be ours. We prefer negotiating directly with the listing broker. With limited inventory in our price range and great buyer demand, we feel the only advantage we have is to deal directly with the listing broker, so they have the incentive of keeping both sides of the commission. If your company is the listing agent for an apartment of interest, we would be happy to know. But since all listings are found on StreetEasy, we would surely find out about it, and if interested in making an offer, would negotiate with you or your associates as listing agent. Thank you for your interest, and say hello to Ralph! Buyers aren’t at a disadvantage at all for using a buyer’s agent because of strict, mandatory REBNY co-broking rules. Moreover, the typical 6% commission is built into the sales price so the buyer is paying for representation whether he/she chooses to have it or not. Furthermore, the listing agent is originally loyal to the seller, do you really want that conflict of interest where the listing agent also represents you under dual agency? Lastly, through us you can get a buyer agent commission rebate and earn back some of that commission that you’re paying for anyway in terms of a higher purchase price! I think the offer is appealing, but I don’t think my girlfriend and I would require it. Thank you for the offer though. May we ask for some feedback on why this incentive doesn’t matter to you? 1% of the sale price is pure equity and worth 5% more in purchase price with a standard mortgage. You’ll be able to pay more and much more likely to win versus the competition because of it! Because odds are we won’t use a realtor to buy, so we wouldn’t have to worry about 3, 6, or 9% fees at closing. We are doing all the research, scheduling appointments, and have alerts in place on 5 different listing sites. Other then the unlisted apartments, there would not be much we’re missing by not using an agent. Buyer agent services are free for you to begin with, so you wouldn’t be paying anything at closing. What you’re missing out on is free advice/guidance that you’re paying for anyway in the sales price (the seller pays both sides of the commission and it’s built in, if you don’t utilize representation on your side the seller pays it anyway, just to the listing agent). Have more questions? 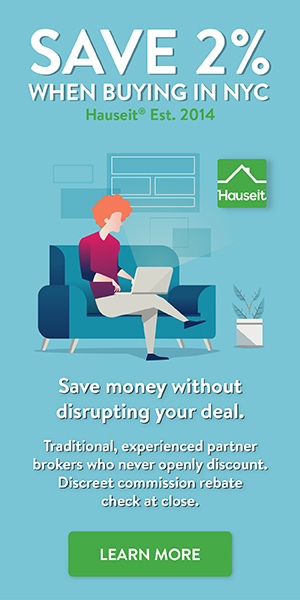 Leave a comment below or ask the New York real estate community in Hauseit’s Forum. Get responses to your toughest questions from NYC’s best real estate brokers, appraisers, lawyers, mortgage professionals and buyers and sellers like yourself.